Yikes……the day is nearly over……and I haven’t consulted with Mr RNG yet…..that’s what happens when you’re in the midst of writing a pattern for a new design…..aargh!!!! Sneaky peak ahead……. Never mind…….you’ll be able to see all of the design in an upcoming edition of Patchwork & Stitching magazine AND for those of you who can’t easily access P & S, I will be posting the design on Craftsy soon enough! *Yippeeeee* I’ve also been busy making some birthday gifties for Barb in our Monday sewing group….. a sweet little family of gathered storage baskets…… that nestle together like a little family!!!!!! taaaaawwwww!!!! Barb thought they were just lovely…..and found a use for them straight away…… ….and even Jen thought they were a bit “Ooh-la-la-parlez-vouz-francais?? ?” !! Designed by the lovely mother and daughter duo, Lisa and Sarah, from A Spoonful Of Sugar, you can find the free pattern for them HERE Well……here’s what you’ve been waiting for…..the winners of the Blog Hoppers Party……. 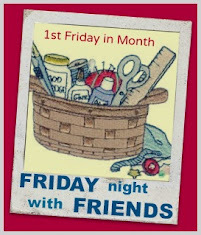 But before I do………I must say a very special thanks to Michele of Quilting Gallery for hosting the blog hop. If you haven’t been to her site before, it’s well worth a look…I highly recommend it! And also, many apologies…..I was overwhelmed with over 100 responses and comments on my blog post……and all the comments were so lovely……it felt like I was engulfed in warm sugary hugs……thank you!!!! ….. .and I haven’t been able to answer them all….please know I have read them and will get around to answering them all……. ok……here goes…… 1st Prize……#26 kim leavens said... Hi Wendy, love your blog and your beautiful work!! November 23, 2013 at 12:51 AM 2nd - 5th Prizes….. #23 Tammy said... Hi Wendy. I love your blog. And read all your posts...Enjoy it all. Thank you for a chance to enter your giveaway. November 22, 2013 at 11:07 PM #65 Yarncrafter said... Hi, have really enjoyed reading your blog. I especially liked the sew finished projects. Thanks so much for the opportunity to win some wonderful prizes. I wish good luck for everyone who leaves a comment to win these prizes. Thanks again for the opportunity. I look forward to getting that pattern in P & S when it comes out. Love those baskets.. LOL good one Jenny!! I love your little baskets! Well done Wendy...look forward to seeing the "sneaky" in it's full glory later! Beautiful little pouches. Can not wait to get my hands on your new pattern. Congratulations on the publish of it in P&S. Thanks to for the freebie link. Can't wait to make this adorable little set. Have a lovely :) Love'n'hugs. I love the baskets, and Jenny's clowning around. =) Congratulations to the winners! I look forward to your pattern going on Craftsy.